So atheists have a higher IQ.This has left me with a warm feelling. Chris, I replied to what looked like your words. Then, reading the link, I saw that you had used its opening words without putting them in quotation marks. I should have included more of the article. Maybe, but when you use the words of others, identifying them as the product of others is, as the French say, de rigueur. You caught me being lazy. I usually write read the rest here, or something like that. Prejudice is of particular interest because understanding the roots of racism and bias could help eliminate them, Hodson said. For example, he said, many anti-prejudice programsencourage participants to see things from another group's point of view. That mental exercise may be too taxing for people of low IQ. Perhaps fiction for the young, such as afternoon cartoons, would be a fruitful way to engage empathy for outgroups. Entertainment for adults, such as soaps or fantasy, can also engage empathy for outgroup characters in emotionally safe fantastic settings. Series such as Lost Girl, Being Human, and Grimm portray both menacing and friendly outgroup characters, without intellectual burden to the audience. 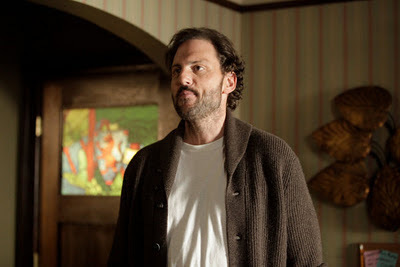 Monroe, the cuddly werewolf, is my favorite Grimm character. There may be cognitive limits in the ability to take the perspective of others, particularly [that of] foreigners," Hodson said. "Much of the present research literature suggests that our prejudices are primarily emotional in origin rather than cognitive. These two pieces of information suggest that it might be particularly fruitful for researchers to consider strategies to change feelings toward outgroups," rather than thoughts. Outside that study's scope and also fruitful for researchers: strategies to change feelings of conservatives toward themselves. A recent Sixty Minutes program told of books by a fundamentalist couple recommending the use of physical violence with children. Such violence begets fear, and conservative organizations use fear of the future to get money, just as conservative candidates use fear of liberalism to get votes. The verbal violence expressed by audiences at recent Republican candidates' debates probably also arises from their fear. A perception of the world based on fear seems to be driving a lot of legislation in the U.S. Fear is being exploited for political gain. "...One of the characteristic traits of conservatism is to see the world at large as a dangerous place, filled with threats natural and man-made. This is why conservatives tend to be tough on crime, more concerned about the threat of illegal immigration and more ‘hawkish’ when it comes to defence and foreign policy. Another characteristic is to see the world as a meritocracy: people generally get what they deserve, be it positive or negative. This means if you work hard, you deserve to be rewarded (and the government doesn’t have a right to rob you of the fruit of your hard work and give it to the lazy and undeserving). Yet if you flout the law, or if you break social conventions, you deserve whatever punishment you get (being ‘soft’ on crime or ‘rehabilitating’ criminals just perverts the natural order and encourages more deviant behaviour)..."
I've been wondering why Republicans and Conservatives are so difficult to talk with. The following article (excerpt above) Why Conservatives are climate change skeptics is about how conservatives have a different world view than liberals. It's no wonder that I can't even talk with conservatives about the weather. "...why Republicans and Conservatives are so difficult to talk with." I've noticed this too, and wondered if it's because they are so stressed out that they are unable to deal with additional stress. Couple their stress with the cruelty shown by audience members at Repub candidate debates (cheering Ric Perry when he spoke of executions in Texas prisons, attacking the gay soldier in Iraq/Afghanistan, etc), and I wonder if it's the result of violence they'd known as children. Is all that explained by fundamentalists' relying on the biblical thing about sparing the rod and spoiling the child? The sparing the rod is probably a portion of the overall problem. I worked with a guy who was a member of a Christian Identity sect of the Baptist Church. That church was one of the biggest buildings in town. A lot of the people I worked with belonged to that church or another that preached about the Christian Identity movement. Anyway the guy spoke bragged about using corporal punishment on his grandchildren who were three to twelve years old. I suggested that if he learned how to communicate better he might get his point across better without having to resort to hitting them. He replied with something like "yea, maybe - but this works for me." He didn't want to hear any ideas from me. parishioners caused more problems. The requirement to believe the bible is inerrant must cause conflict for them. I suppose eventually they give into the believe that the bible is entirely factual in-order to belong to the family group and community. People have to be intellectually dishonest with themselves to believe that - which makes everything they base their lives on a lie. It seems to me that ultimately their binary (black and white) thinking is the most problematic. What else causes that? - Is it a coping mechanism that allows for believe in biblical inerrancy? As far as I'm concerned, conservatives fear the wrong things. In the face of Climate Destabilization rendering the planet uninhabitable for their children and grandchildren, and the species as a whole, they're afraid of illegal immigrants, abortion, and gay marriage. That's "penny wise and pound foolish" fear! Right's Stupidity Spreads, Enabled by too-polite left. "...But what we now see among their parties – however intelligent their guiding spirits may be – is the abandonment of any pretence of high-minded conservatism. On both sides of the Atlantic, conservative strategists have discovered that there is no pool so shallow that several million people won't drown in it. Whether they are promoting the idea that Barack Obama was not born in the US, that man-made climate change is an eco-fascist-communist-anarchist conspiracy, or that the deficit results from the greed of the poor, they now appeal to the basest, stupidest impulses, and find that it does them no harm in the polls. Don't take my word for it. Listen to what two former Republican ideologues, David Frum andMike Lofgren, have been saying. Frum warns that "conservatives have built a whole alternative knowledge system, with...". The result is a "shift to ever more extreme, ever more fantasy-based ideology" which has "ominous real-world consequences for American society". It's worth reading the entire article instead of just the excerpt I posted above. Frum's warning that conservatives built an alternative knowledge system complete with its own facts, history and laws of economics seems true enough.